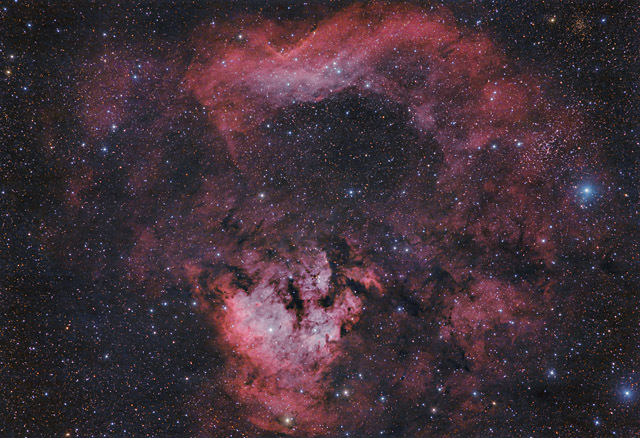 Covering over six square degrees in the constellation of Cepheus, NGC 7822 and Cederblad 214 (aka Sh2-171) form a large molecular cloud and star forming region. NGC 7822 forms the faint northern arch at the top of the image, while Cederblad 214 is the brighter nebula towards the bottom. This field of view is filled with a multitude of young stars born from the hydrogen gas in the cloud. These young stars also form several clusters within the nebula. The cluster Berkeley 59 is located at the heart of Cederblad 214, while NGC 7762 is towards the upper right of the nebula "ring"
Within Cederblad 214 is one of the hottest known stars in our stellar neighborhood. With a temperature of almost 45,000 degrees Kelvin, BD+66 1673 is over 100,000 times more luminous than our own Sun. Also contained within Cederblad 214 are numerous Bok globules - areas of of condensing gas from which young protostars are created. In this image, North is up. This image is cropped to 92% of the original image. Notes I'm pretty pleased with the final result of this image, as I think the blend of Ha, OIII, and RGB ended up with an overall natural looking color to it. I'm also quite happy with the broad range of color I was able to capture throughout the stars as well as the nebula. I had not completely resolved some of the colliimation problems with my new Nikon 600mm f/4 lens, but I was still able to capture some tight stars with a minimum of coma. I also continued to use some new stretching techniques that seem to be showing good promise.